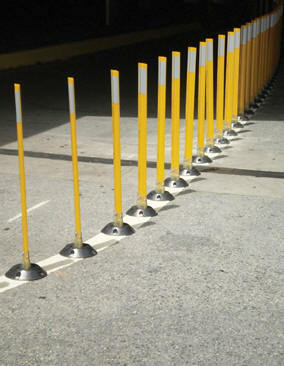 Surface Mount Flexible Stakes Ideal for high traffic and high impact locations. Constructed of polycarbonate extrusion and flexible hinge which makes it virtually indestructible. Easy four part assembly which is the post and hinge, 8" diameter base, grips and pin. Quick to install, they can be mounted to concrete, asphalt, wood and other hard surfaces using appropriate hardware (not included). FAA approved. Other colors and styles are available. Specs: Overall Height 24", Width 3-1/4", Colors White, Yellow, and Orange.